He won his first presidential election in 2005 by a razor thin margin of 180,000 votes. Five years later, Sri Lankan President Mahinda Rajapaksa was re-elected, by a victory margin of over 1.8 million votes. Since then, the man hailing from the deep south of the country has proved countless detracters and arm-chair critics wrong. There were doubters who did not think he could get his own party's candidacy for the 2005 presidential race to replace Chandrika Kumaratunga. Ever fewer gave him any chance of victory when he launched military operations against the Liberation Tigers of Tamil Eelam (LTTE) in 2005 to end the island's long years of bloody civil war. But during his career in politics spanning over four decades, Rajapaksa has always been known as a gritty fighter and a survivor. He is famous for taking his fight on to the streets  in 1992 he led a 170 mile (275 km) protest march against then administration of President Ranasinghe Premadasa from the capital Colombo to the southern town of Kataragama in eight days. In the last five years, he has not only survived, but has cemented his legacy without a single serious challenger in sight. Today, his popularity is at an all-time high, stemming largely from his unwavering political leadership during the Sri Lankan military's stunning assault on the Tamil Tigers that destroyed the separatist group between June 2006 and May 2009. His second victory in this year's presidential election was even more significant given that his main challenger was Sarath Fonseka, the man who led the military to the Tigers' crushing defeat. In April, he led his United People's Freedom Alliance (UPFA) coalition to another huge victory. The coalition's 144 seat haul in general elections was just six seats short of two-thirds majority in the 225 member parliament. Throughout his career, one of Rajapksa's main traits has been his reliance on close family members. Immediate family members who hold top and influential positions in his government have steadily risen, despite complaints from the opposition of nepotism. But the Rajapaksa family has long been one of the most politically influential in the nation. His father D.A. Rajapaksa was a member of the first Sri Lankan parliament after the island gained independence from the British in 1947. President Rajapaksa first entered parliament in 1970, succeeding his father from the family electorate of Beliatte in the south in 1970. But at no time has the family been this influential in national politics. TIME takes a look at the long reach of this powerful family. The 65-year-old political pro has built on his slim victory in the 2005 presidential election and now enjoys unassailable levels of popularity, especially among the rural voters from the majority Sinhala community. He staked his political career and the presidency on the military defeat of the Tigers when the war erupted in 2006 after a four year hiatus. By May 2009, the war was over, the Tigers were destroyed and Mahinda Rajapksa's legacy was made. Even though he was the second eldest in the family, Mahinda was the first to enter parliament in 1970. He has been an active member of the leftist Sri Lanka Freedom Party (SLFP), and, as president, has taken efforts to revive the party. The eldest of Mahinda's nine siblings, Chamal entered parliament in 1985 after stints in the police force and public sector. The quietest member of the family, he does not court controversy or criticism as his three other brothers in the administration do. In April, he was elected speaker of the new parliament. His entry into the limelight of Sri Lankan politics came after his brother was elected president in 2005; he had settled in the U.S. before he returned to coordinate the presidential campaign in 2005. Soon afterwards, Basil was appointed as a presidential adviser and then to parliament through the national list  seats that appointed by the party. He is believed by many to be the main political strategist in the government, trusted completely by his brother. President Rajapaksa entrusted the important task of spearheading rebuilding the war-ravaged northeast to Basil, and he now also holds the cabinet portfolio of Economic Development in the new government. Like his brother Basil, Gotabaya was living in the U.S. before he returned to Sri Lanka to assume the powerful post of Defense Secretary when his brother was elected president in 2005. He had been a career military officer for two decades, involved in battles against the Tigers till he retired in 1991. His no-nonsense approach to wiping out the Tigers when the war heated up again in 2006 drew wide international criticism but proved successful in the end. He is widely popular in the country and is credited by many with being a key architect of the successful counterinsurgency strategy that ended over two and half decades of bloodshed. 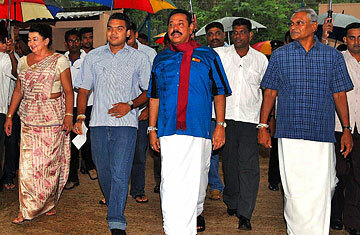 The newest member of the Rajapaksa clan to enter the political arena, Namal, 24, is the eldest son of the President. He is an unknown political entity, but topped the votes from his native Hambantota District when he stood for election at the last general election, even out-gunning Uncle Chamal. In a symbolic gesture of handing over the family's political legacy, President Rajapaksa draped an earth brown shawl  a symbol of the family's rural roots  around his eldest son's neck as he left his first parliamentary sittings in Colombo. Namal has two brothers: Yoshita, 23, who is in the navy, and Rohitha, 21.